Are girls really sensitive and boys ‘thick skinned’? Every man’s skin is unique to him and his lifestyle but here are some basic, common characteristics to ponder on - plus what they mean for his skincare regime. Thanks to testosterone, the epidermal (outer protective layer) of male skin is about 20-30% thicker than female skin. A higher collagen density means that male skin appears firmer, which can see them age with fewer wrinkles and lines – you lucky boys! However, the texture of male skin is often rougher. A slower rate of absorption demands deeply penetrating moisturisers to smoothen rough skin. Also, studies have suggested that high levels of testosterone can poorly affect the skin’s barrier functions. There’s a greater need for men to use products formulated to help rebalance and improve the skin’s barrier repair mechanism - look out for Pro-Vitamin B5 on the label. Puberty leaves men with very active sebum and sweat glands. Male skin is thus usually oilier. Pores can quickly become large and clogged, setting the scene for cystic acne and ingrown hair. However, testosterone levels diminish with age, leaving men with increasingly dry skin later in life. Male skin needs to be deeply cleansed, regularly. Exfoliation is a critical step that many men neglect. De-clogging pores helps prevent the formation of blackheads. Look no further than our skin refining AHA Exfoliating Face Scrub. Moisturising the face will become increasingly important with age, to compensate for a decrease in the face’s natural oil production. Facial hair works as a physical shield against UV rays. Shaving can be very damaging to the skin as it slices off the top layers of skin particles and can leave skin parched and irritated. Dry skin is a major contributor to razor burn. Firstly, don’t neglect the broad-spectrum SPF 30+ sunscreen! 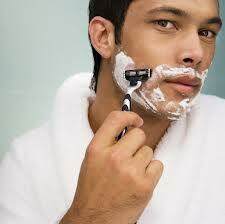 Second, regular shaving can leave male skin very sensitive, presenting another critical reason to moisturise. Our lightweight Youth Regenerating Moisturiser not only improves hydration to the skin by over 28% but can combat free radical sun damage with its antioxidant power. This moisturiser’s natural ingredients like aloe vera can have soothing and anti-inflammatory properties to the skin. Plus, its patented and ultra-penetrating monk’s pepper berry complex will help rejuvenate and restore the skin’s youthfulness and skin tone. Male and female skin may be structurally different, but their needs are in many ways alike- regular deep-cleansing, protection from the elements and the moisture afforded by a gentle, non-pore-clogging formula.